Planning to head out on a camping trip with your ‘special someone’? Well then, what are you waiting for?! Camping is an amazing activity that you can do with your partner. It is extremely fun and the best part is you and your partner get take take a few days off from your busy schedule and have a stress free trip. You get to enjoy the beauty of nature, which you can rarely enjoy because when you are back home, I’m pretty sure you are too busy with work. Therefore, you and your partner should take the weekend off and pretty much enjoy the beauty of mother nature and at the same time, enjoy the presence of each other. When you go for a camping trip with your partner, you should get a 2 person sleeping bag so that you and your partner will be close by when you are sleeping. However, you have to make sure you go through the important factors before you pick your 2 person sleeping bag because if you pick the wrong one, you and your partner might feel really umcomfortable! Therefore, make sure you know how to choose the right sleeping bag for two people. Top 2 Person Sleeping Bag Comparison Table. This is actually really important because a temperature rating is basically the lowest temperature the bag is able to keep you warm. Let’s say you are camping during a really cold season, make sure your sleeping bag has a really low temperature rating, such as -10 degree celsius. This means, the sleeping bag will be able to keep you warm until the temperature of the area reaches -10 degree celsius but don’t worry! You can always add a liner to keep your more warm. There are two types of fillings that are commonly used, which are synthetic filling and down filling. Synthetic filling can last much more longer compared to down filled sleeping bags. Moreover, synthetic filled sleeping bags are much more cheaper compared to a down filled sleeping bag and the synthetic filled bag has insulation when it gets wet. However, synthetic filled sleeping bags are slightly heavier and bulkier so that could be a problem for certain people especially those who hike to their camping sites. The weight of your sleeping bag should not be too heavy. This is really important because if it is too heavy, you might face difficulties in carrying your sleeping bag around. Moreover, the other things you will be packing would also be slightly heavy so you should consider getting a lighter sleeping bag. Another reason why lighter sleeping bags are much better is because they will not cause you to experience body aches, that is usually caused when you carry heavy objects. This sleeping bag comes with two pillows, which would be perfect for two people. At least this way, you and your partner do not need to get separate pillows for this sleeping bag as it is already given. You get to save your money and your time. This Sleepingo sleeping bag has a temperature rating of 32 Degree Fahrenheit or 0 degree celsius, which is perfect if you are someone who loves to camp during cold seasons. This sleeping bag will keep you warm as long as the surrounding temperature is 0 degrees celsius. However, if you are in a place which is lower than 0, you can always wear thicker clothes or add in a blanket to make sure that you are warm. When you are warm enough, you will be able to have a good and comfortable sleep. This sleeping bag weighs around 3 lbs, which is not that heavy. This is actually important because when most people go for camping trips, they think of it as an adventure! They prefer hiking to their camping sites instead of driving so if you are the type of person who prefers to hike rather than drive, then you should make sure that the 2 person sleeping bag you choose is not that heavy and can be easily carried so that you will not face any problems during your camping trip. This sleeping bag is also said to be really comfortable, which is important. I am sure that after a long day outdoor, you and your partner would for sure want to end your day with a good sleep. However, you can only achieve a good sleep if you are laying down on a comfortable sleeping bag. If your sleeping bag is uncomfortable, you are just going to end up tossing and turning around and the next moment, you realise it is already morning. This will cause you to be really sleeping during your morning activities. Therefore, you have to make sure that the sleeping bag is comfortable. Furthermore, this sleeping bag is also very easy to pack and unpack which means it will only take a few minutes, which will not consume too much of your time. A carrying bag is also provided so that you can store it in the bag when you are walking to your campsite. This is actually convenient for you because since a bag is already given, you do not need to get a separate bag for your sleeping bag. Since your 2 person sleeping bag will be kept in the carrying bag, you do not have to worry about it getting dirty because the carrying bag will protect it from any dirt and also any damages that could possibly happen. This Sleepingo Double Sleeping Bag is actually a really good quality bag with a really affordable price. So you and wife are planning to take your little son for a short camping trip but you can’t seem to find a proper sleeping bag that will fit all three of you? Well, don’t worry because this Ohuhu Sleeping bag can fit all three of you. It will be able to fit two adults and also two adults with one child so this would be perfect for couples with one young child, best friends and also just a regular couple. This sleeping bag is filled with with polyester and cotton, which is a synthetic filling. The best thing about synthetic fillings is that they are resistant to water and they are also much more cheaper compared to down filling. They are also hypoallergenic, which means it has chances of causing lesser allergic reactions when in contact with skin. This in a way, is important because when you are camping, you are not exposed to many resources and you are most likely far from towns so if any allergic reactions happen, you are most likely to have a problem, especially if you forget to bring your medication. Moreover, this sleeping bag weighs around 6.08 lbs, which is still light. This is actually really important because you have to remember that you are also going to be carrying other important things along with you for your camping trip. Therefore, you need to make sure that the sleeping bag you choose is light so that you can easily bring it for your camping trip and you will not experience any body aches due to carrying heavy things. This sleeping bag has a dual usage. It can be used as a huge sleeping bag that will be able to fit two people but at the same time, you can detach it and convert it into two single sleeping bags. This is actually really convenient for you because if you decide to go on a short camping trip alone, at least you do not have to get a single person camping bag. You can just detach it and convert it into two single person sleeping bags, which means you do not need to spend more money to get a single person sleeping bag. This sleeping bag is already really easy to pack and unpack it. To pack it back after using it for your camping trip, all you have to do is roll it and fit it into the carrying bag, which is provided. It does not even take up much of your time, which is also good because at least you will be able to enjoy the beauty of nature for a little while more before you head back to your busy life. With this sleeping bag, you are able to withstand a temperature of 5 degree celsius, which is amazing. To those who really enjoy camping whenever it is cold, this is the sleeping bag for you and if you still find it too cold, you can always use a thicker set of clothes or you could put in a blanket. This sleeping bag would be perfect for cold weathers! The price of this sleeping bag is also really affordable so what are you even waiting for? TETON Sports Mammoth Queen Size Sleeping Bag. This specific model comes in sizes different colours so you will be able to choose whatever colour that suits you the best. This is good because you are given a choice to choose your favourite colour, which could make you have a slight attachment to your sleeping bag. For this TETON Sleeping Bag has two types where each sleeping bag has different temperature ratings. If you are someone who prefer camping during really cold seasons, then you should pick the sleeping bag with the temperature rating of 0 degrees fahrenheit, which will be perfect! It will be able to keep you warm in the cold. However, if you are going to a slightly less cold place, then the 20 degrees fahrenheit would be good enough to keep you warm. It basically depends on the the surrounding temperature of your camping area. This Queen Size Sleeping Bag has a mummy hood, which is actually a really good additional feature. This mummy hood basically functions to keep your head off the ground. This is actually good because now, because you will be able to protect your head from the dirty ground, which is a feature that is not on every sleeping bag. Moreover, this sleeping bag is also comfortable. It is extremely important for it to be comfortable because you will be sleeping on it. If your sleeping bag is uncomfortable, you will not able to sleep well and this could cause you to be really sleepy the next day. This will make it very difficult for you to do the activities that you have planned for your camping trip. Therefore, make sure your sleeping bag is comfortable. The best part about this sleeping bag is you do not have to roll it again whenever you want to store it. Basically, this sleeping bag comes with a compression sack that will make sure you are able to stuff your sleeping bag into it. This way, you do not need to roll it back and have a hard time putting it back into the sack. This sleeping bag is really durable, which will make sure that no damages will ever happen to your sleeping bag. This is actually really because since it is durable, it will not get damaged easily which proves that it will last long so you do not have to be buying a new one anytime soon. The price of this sleeping bag is slightly high but it is considered a really good quality 2 person sleeping bag. Gideon Extreme Double Sleeping Bag. This sleeping tent is made of a really durable fabric which is non allergenic, which means it does not cause any allergic reactions, which is really important especially if you are someone with sensitive skin or even someone who has a lot of allergies. Since this material is durable, it will be able to withstand any rough camping situations which means this sleeping bag will be able to last really long so you don’t have to buying a new one anytime soon! You find your sleeping bag dirty and you are planning to clean it? Well, don’t worry because this sleeping bag is extremely easy to clean. All you have to do is toss it into the washing machine and let your machine do it’s job. Then, all you have to do is dry the washed sleeping bag and you are finally left with a clean sleeping bag. So you are planning to go camping with your best friend but you are not comfortable sharing a sleeping bag with him or her? Why fear when you are using a Gideon sleeping bag? 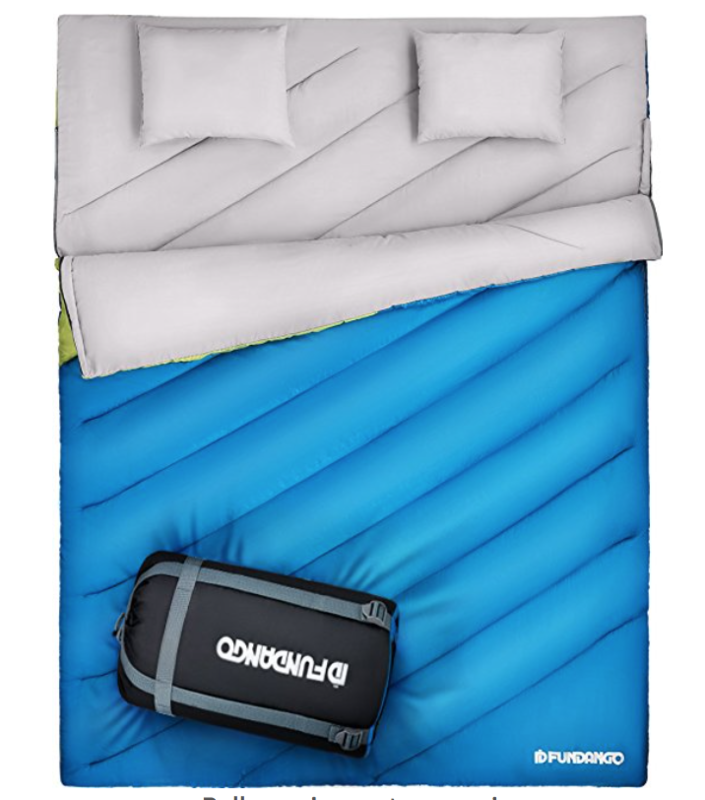 With a Gideon Sleeping bag, you can always separate your double sleeping bag into two separate single sleeping bags. This will make it more comfortable for you to sleep every night when you go camping with your friend. Moreover, if you want to, you can always attach it to become a double sleeping bag whenever you want to. This sleeping bag is also lightweight, which means you will not have a problem when you are carrying this sleeping bag. Therefore, if you are someone who really enjoys hiking to your camping site, then this would be the perfect sleeping bag for you to carry because it is light and you will not find it difficult to carry it. Moreover, since it is lightweight, you will not have any back aches too. 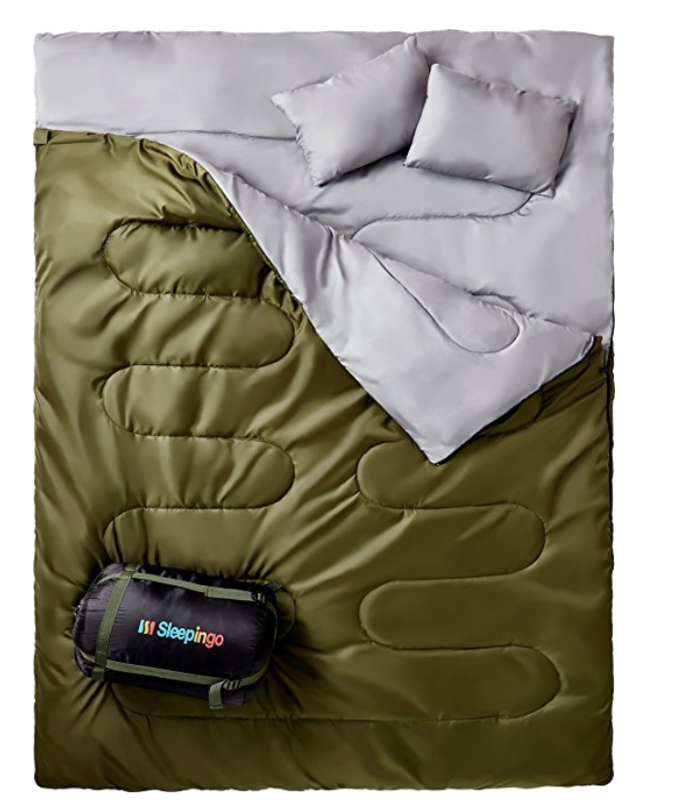 This sleeping bag has a temperature rating of 50 degrees Fahrenheit, which is good enough. It will be able to withstand the temperature until it reaches around 10 degrees celsius. However, if your camping site has a temperature below that, you can use thicker clothes or add a blanket to keep you warm but if that does not work, you should get a sleeping bag that will be suitable for that temperature. This Gideon sleeping bag has good qualities and is suitable even if you want to use it as single sleeping bags. The price of this sleeping bag is really affordable so what are you waiting for?! FUNDANGO Queen Size XL Double Sleeping Bag. This sleeping bag is actually really comfortable, which is extremely important because if you get an uncomfortable sleeping bag, you will face difficulties having a good sleep at night. If you do not get enough sleep, you will end up being really sleepy the next morning and you will be too tired to do your planned activities for that morning. Therefore, to make sure you get enough sleep, you have to ensure that your sleeping bag is comfortable. The best part is that this sleeping tent is really huge. It is much more bigger compared to most double sleeping tents. This is actually really convenient for you because you and your partner will have a lot of space to move around. This can actually make you feel really comfortable and you will be able to rest well on this sleeping bag. This sleeping bag has a temperature rating of 0 degrees Fahrenheit, which is around -18 degrees celsius, which is pretty amazing. This sleeping bag will surely keep your warming whenever you camp in a really cold area so you do not have to worry about it. However, if you still do not feel warm, you can always use thicker clothes or use a blanket. You can also separate this huge Queen size sleeping bag into two single sleeping bags, incase you are going to be camping with your friend, where you might feel slightly uncomfortable to share a sleeping bag. The process of separating one into two does not take a lot of time and always remember that you can attach them back whenever you want to. This sleeping bag has a weight of 7.5lbs, which is around 3 kg, which is not that heavy. You will still be able to carry it whenever you are planning to hike to your camp site. It is extremely important to make sure that your sleeping bag is light so that you will not face any back aches, that are usually caused when you carry a lot of heavy things. This FUNDANGO sleeping bag would be perfect for you and the price is also affordable! Grizzly 2 Person Sleeping Bag. For this Sleeping Bag, there are two types, one which is made of canvas and the other one is made from a RipStop material. Therefore, before you choose, make sure you choose the correct one. You can choose between three different temperature ratings. The choices are -25, 0 and 25 degree Fahrenheit. However, before you make your choice, you have to make sure you know the surrounding temperature of your camp site so you do not buy the wrong one because if your area is extremely cold, you should get the 0 or -25 degree fahrenheit sleeping bag. If you still feel cold, you can always use a blanket. When your sleeping bag gets dirty, don’t worry! Just put it in your washing machine and your machine will do the rest. Once it is washed, all you have to do is hang it somewhere, where it can be exposed to sunlight the most, so that it will be able to dry and then you are finally done! Your sleeping bag is ready to be used for the next trip. This sleeping bag weighs around 18.4 lbs, which is slightly heavy. This could be a problem for those who love hiking to their camp site. You might face difficulties carrying this sleeping bag. However, if you drive to your camp site, then you do not have to worry. This sleeping bag would be fine for you! You will not face any problems with it. If you carry a really heavy item for a long time, you may face really painful back aches and I’m pretty sure you would not want to start your trip like that. Furthermore, this sleeping bag is also comfortable, which is really important because if your sleeping bag is not comfortable, you will not be able to sleep well. When you can’t sleep well, you will be extremely tired the next morning, which could cause you to be too tired to do your planned activities. Therefore, make sure your sleeping bag is comfortable. The price of this sleeping bag is actually a little high but thats what you pay for a good quality sleeping bag. This Double Sleeping Bag has a really cool feature where you can detach it and turn it into two separate single sleeping bags, which would be perfect if you are planning to go camping alone or if you are going to go camping with your friend. It is not that difficult to detach this double sleeping bag into a single sleeping bag and when you can always attach it back into a double sleeping bag whenever you want to. Furthermore, this sleeping bag has a temperature rating of 25 degrees Fahrenheit, which is perfect if you are planning to go camping during a cold weather. This sleeping bag will be able to keep you warm during the cold weather. However, if you still feel cold, you can always use a blanket or wear thicker clothes. This sleeping bag is also said to be really comfortable, which is important because I am very sure that after a long day out, you and your partner would want to end your day with a good sleep. However, you can only get a good sleep if you are laying down on a comfortable sleeping bag. If your sleeping bag is uncomfortable, you are just going to end up tossing and turning around and the next moment, you realise it is already morning. This will cause you to be really sleeping during your morning activities. This sleeping bag weighs around 6.2 lbs, which is quite light. This is important because if it is too heavy, you might have some problems when it comes to carrying this sleeping bag, especially if you are someone who hikes to your camp site most of the time. Therefore, you need to make sure that the sleeping bag you choose is light so that it is easy to carry and you also get to avoid back aches, that are usually caused due to carrying heavy things. This CHILLAX Sleeping Bag is made of high quality materials that will make sure you are kept warm and at the same time, these materials will not get damaged that easily. This is actually important because if your sleeping bag gets damaged easily, you will have to purchase a new one just to replace it. Therefore, if you purchase this sleeping bag, you will be able to own a long lasting sleeping bag. This sleeping bag is amazing yet the price is not that high and it is really affordable. Sleeping bags are really important to make sure that you are comfortable when you are sleeping. When you go with your partner, you should get a double sleeping bag that will be big enough to fit both of you. There are many types of sleeping bags that you could choose but make sure you go through the important factors in choosing a sleeping bag so that you get the right 2 person sleeping bag for your camping trip. You should check out some really useful things that could be helpful for your camping trip.